A 28-day-old male infant (3.5 kg) presented with tachypnea and cyanosis. On evaluation, he had dextro-transposition of great arteries with ventricular septal defect. The neonate underwent an arterial switch operation (ASO) with moderate hypothermic cardiopulmonary bypass (28°C). He was shifted to the Intensive Care Unit (postsurgery) on inotropic support (dopamine and dobutamine [5 mcg/kg/min each]; nitroglycerine [0.5 mcg/kg/min]). Transthoracic echo revealed good biventricular contractility, mild tricuspid regurgitation. Soon after extubation (in 48 h), features of isolated (left) facial nerve palsy were noticed (drooping of angle of mouth, loss of nasolabial fold, dribbling of saliva) [Figure 1]. The affected eye remained partially open during sleep. Noncontrast computerized tomography of the head was normal. The neonate was initially fed through nasogastric tube before resuming oral feeding. There was no sucking/swallowing difficulty. For Bell's palsy (provisional diagnosis), injection dexamethasone was given (0.3 mg/kg/day for 3 days). Oral prednisolone was continued for 2 weeks. He showed no improvement of facial palsy after 14 days. However, salivation and partial eye opening during sleep improved. We gave symptomatic treatment with methylcellulose eye drops. Prednisolone was tapered over next 2 weeks. The patient remained stable and was feeding well. He was electively discharged. On follow-up after 4 weeks, the child still had some features of Bell's palsy. However, in the second review after 12 weeks, the baby has shown improvement with no facial asymmetry and gained weight. Neurological insults such as cognitive impairment, memory loss, encephalopathy including seizures, paralysis, coma, and brain death after cardiac surgery have been reported in the literature. Among these, seizures are the most commonly reported. Isolated cranial nerve injury (peripheral) after cardiac surgery is an extremely rare event. The most commonly injured cranial nerves reported are the superior laryngeal nerve and hypoglossal nerve. Idiopathic facial palsy (also called Bell's Palsy) in the newborn is rare, occurring in 0.23% to 1.8% of live births. Birth trauma, vascular ischemia, autoimmune inflammatory phenomenon, and heredity may be causative mechanisms. In addition, reports of neonatal Bell's palsy  caused by traumatic delivery, congenital malformations, and infections including otitis media (as early as 2 weeks of life) with rapid response to oral steroids (and antibiotics where indicated) are also available. Cayler cardiofacial syndrome would be close mimic to Bell's palsy; however, in our case, the mother remembers normal features till before surgery. Besides, persistence of asymmetric face during sleep also excludes the Cayler cardiofacial syndrome. This baby developed facial palsy after ASO temporally, with no initial response to systemic steroids. The cause may be a vascular ischemia (transient) or compressive neuropathy. Neonatal idiopathic facial nerve palsy as in our case is rarely encountered. Extensive literature review yielded a similarly isolated case report of isolated facial nerve entrapment after an ASO, which recovered completely. The child on regular follow-up shows improvement. We highlight this rare complication after pediatric cardiac surgery, for the early recognition and treatment benefit by caregivers involved such as cardiologists, cardiac surgeons, and intensivists. Menache CC, du Plessis AJ, Wessel DL, Jonas RA, Newburger JW. Current incidence of acute neurologic complications after open-heart operations in children. Ann Thorac Surg 2002;73:1752-8. Saini A, Singhi P, Sodhi KS, Gupta A. 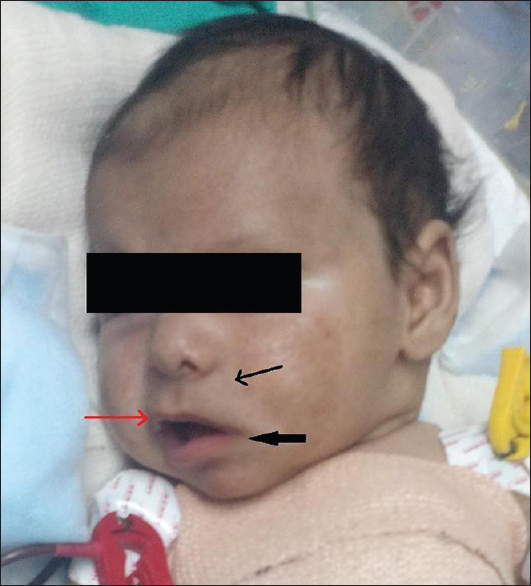 Bell palsy in a neonate with rapid response to oral corticosteroids: A case report. J Child Neurol 2013;28:506-8. McLellan MS, Parrino CS. Bell's palsy at 1 month 4 days of age. Am J Dis Child 1969;117:727-9. Pawar SJ, Sharma DK, Srilakshmi S, Reddy Chejeti S, Pandita A. Cayler cardio-facial syndrome: An uncommon condition in newborns. Iran J Pediatr 2015;25:e502. Alcaraz A, Lopez-Herce J, Castro P, Bustinza A, Moroto C. Facial nerve paralysis following pediatric cardiac surgery. Panminerva Med 1995;37:148-9.